Apple's own firmware for the upcoming HomePod speaker has proven to be the gift that keeps on giving for enthusiasts, this time revealing that a next-generation Apple TV will boast support for 4K video, as well as high dynamic range in both 10-bit and Dolby Vision formats. Developer Guilherme Rambo once again dove deep into the HomePod firmware to find reference to a "4kHDR" display mode. Digging even further, he found references to display modes for "HDR10" and "Dolby." In addition, AppleInsider reader Marc Bach also pointed out on Twitter that HLG, also known as Hybrid Log-Gamma, is another supported HDR mode. The royalty-free HDR standard was developed by the BBC and NHK. The references would seem to confirm that the next-generation Apple TV will not only include support for ultra-high-definition 4K content, but also three popular HDR modes for better contrast and colors. The HomePod firmware leak comes just a few weeks after Apple also seemingly accidentally confirmed 4K and HDR plans on the iTunes Store. Users found that some new releases listed availability in 4K resolution and high dynamic range —going well beyond the 1080p high-definition content that currently populates the iTunes Store. Apple's planned support for 4K content on iTunes isn't a surprise, as films and other programs are now becoming available in UHD resolution to support new high-end 4K TVs. Netflix, for example, streams its new original series in 4K, and the Xbox One S is capable of reading 4K Blu-rays. But the Apple TV remains lagging behind the competition in that respect, maxing out at 1080p resolution and not offering any HDR support. 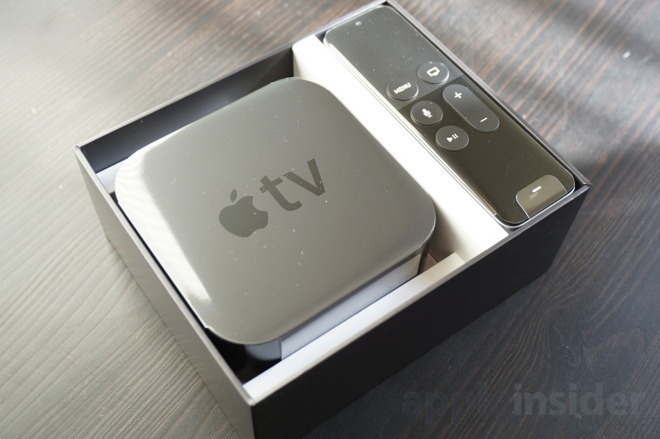 Hardware limitations within the current Apple TV with Siri Remote prevent it from supporting 4K resolutions with a software update, meaning a new set-top box is necessary. Given the information found in the HomePod firmware, it would seem that a new 4K and HDR capable Apple TV is on tap for this fall. That falls in line with rumors from earlier this year, which claimed that a hardware refresh known as "J105" will support 4K and HDR, though not much else new is expected. Apple does already have products in its lineup capable of displaying proper 4K content: the 21.5-inch iMac boasts a Retina 4K display, and the 27-inch iMac has a Retina 5K display. Notably, Apple's recent iPhone models dating back to the iPhone 6s also shoot 4K resolution video. But that content has its quality reduced to 1080p when played back on an Apple TV.